We enjoyed a marvelous dinner and evening chez our dear long-time friends Ginetteand Chaim Reich who announced over Perrier Jouet Fleur de Champagne the engagement of their son Daniel. I first met the Reichs when Ginette was 1 week away from delivering him so it was a very sentimental evening. 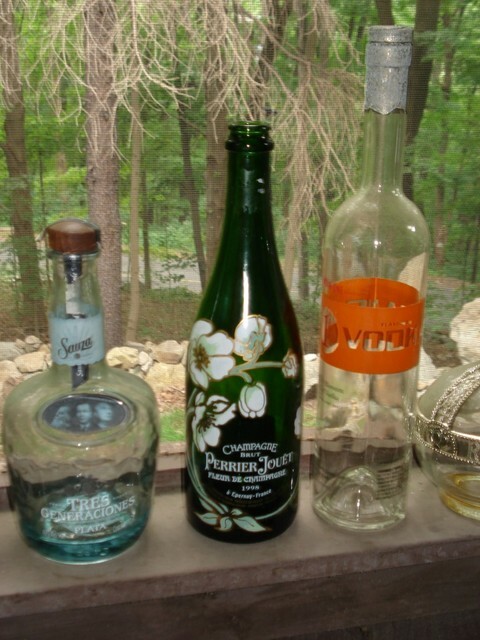 And generous Ginette offered me the beautiful painted champagne bottle to add to our porch collection (we love how the light comes through the bottles at sunset) along with two matching champagne glasses. Everyone brought a present for New Years. Ours were these two challat. I knew that tradition dictated a round shape but Ginette told me the Israeli tradition called for two--one for the blessing. It turned out that one large one was enough for dinner as well so now she can enjoy slices of the second one from the freezer for several weeks to come! Chaim, after saying the blessing for the bread, searched around for an appropriate knife and decided to go with what he said was the Sophardic tradition of tearing the bread. Funny how torn bread versus sliced changes the perception of flavor along with the texture. 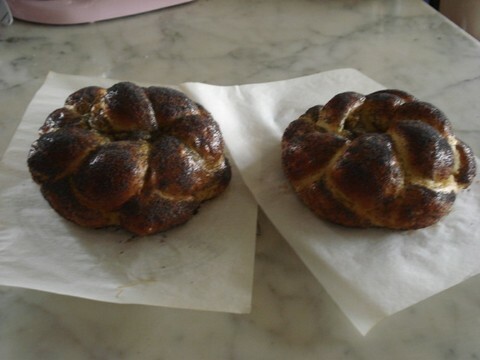 This was a first for me with challah. Incidentally, it also turned out that 4 pounds of challah dough were too much even for my new Zo, so I finished kneading it by hand, taking care to add as little flour as possible to keep the dough sticky so it would be as light and moist as usual. It worked just fine. Everyone seemed to love it as there wasn't a poppy seed left of the first loaf.